The Israeli government today exchanged 20 female Palestinian terrorist prisoners for a video proving that IDF soldier Gilad Shalit, kidnapped by Hamas in 2006, is still alive. Shalit was captured in an ambush on June 25th, 2006, on the Israeli side of the Gaza border. The last sign of life received was a letter from Shalit in 2008. A controversy has formed in Israel over how to obtain Gilad's release - whether or not to release terrorists from prison, and how many (Hamas often demands several hundred). Military efforts to free him have all been unsuccessful. 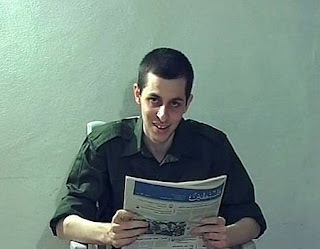 In the two-minute video, Shalit reads from a script while holding a September 14th Gaza newspaper. He takes a few steps, presumably to demonstrate his good health.